New-Old Stock! Seals Brand Cockpit Covers from a kayak shop that closed. For recreational two-man kayaks with a single large cockpit. No ordinary cockpit cover! Water tight and bomb proof. Keep rain, dirt, bugs and critters out of your kayak during storage and transportation. Made from a tear-resistant rubberized cargo cover material with superior UV protection and double-stitched seams. The Seals brand Rim Grip Technology, the adjustable bungee cord rim and tether secure this Close-Out Cockpit Cover to your cockpit coaming snuggly. This cover can be used for car topping if properly secured with extra tie down straps. Stock color is black. See the Seals Cockpit Cover How-To Video. Use the Seals Cockpit Cover Sizing Tool to see if the T-300 will fit your kayak. 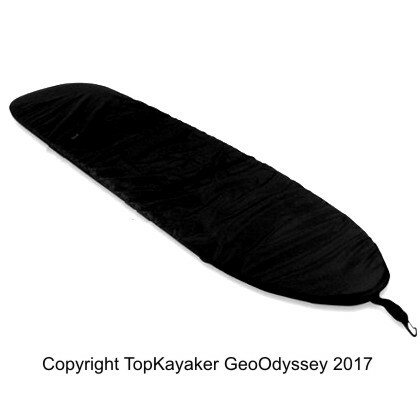 This same Tandem Cockpit Seal is also available at full price by special order for most makes and model of tandem kayaks. We will need to know the make and model of kayak, the year made will also be of use. Phone in your order 603-651-1036 to special order a Tandem Cockpit Seal for your kayak. The special order Tandem Cockpit Seal will come with around-the-hull belly straps and a tether hook to make this cockpit cover nearly impossible to loose while car topping and it seals off your cockpit snuggly. New-Old Stock Seals Brand Cockpit Covers from a kayak that closed. Expect some dust and dirt from long term storage. Your satisfaction is guaranteed.